A leap second will be added to 2016. You don’t see this every day. Just every year or two. If, like me, you’re counting the seconds until you can kick 2016 out the door, I have a tiny bit of bad news: You’ll have to count a little higher to do so. According to our clocks, 2016 will be exactly one second longer this year because scientists are adding a leap second to it. Leap seconds are added to the calendar pretty often, actually, on average a little less than one every year. (Note: Leap seconds are wholly different than leap years, which come with their own set of mathematical funness.) This is done to keep our clocks in sync with the rotating Earth. Basically, we have lots of ways of measuring time. One is to very carefully measure how long it takes the Earth to spin once on its axis. We call that a “day.” There are actually lots of different kinds of days—how long it takes the Earth to spin once relative to the Sun, or relative to the average position of the Sun in the sky, or relative to the stars. But all of these are based on the spinning Earth. That was fine for pre-electronic technology, but nowadays we need something better. The Earth makes a pretty ratty clock when you focus in on very tiny timescales. Lots of forces affect our planet’s spin, including the tides from the Sun and Moon, continental drift, and even the way we dam up rivers. The overall change is pretty small: The length of our day now is only about two milliseconds longer than it was around 1820, which is when there were exactly 86,400 standard seconds in a day. 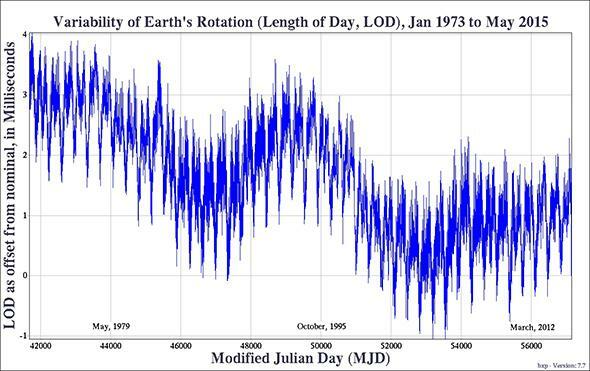 The length of Earth’s day, from 1973 to 2015, measured relative to the 86,400 second day. It goes up and down by a few milliseconds (or a fraction thereof) on several timescales. Currently, the day is about two milliseconds longer than it was in 1820. So yeah, our day is now 86,400.002 seconds. Give or take. I know that doesn’t sound like much, but it adds up. What it means is that the Earth spins a touch slower now and doesn’t keep time as well as the atomic clock does. So, every now and again, we have to correct for it. This is the part that confuses people. It’s not really that the Earth is spinning slower all the time, it’s just that right now it’s spinning slower than it did a while back. Even if the Earth’s rotation were perfectly constant now, we’d still have to add a leap second! I’ll note that some young-Earth creationists use this slowing to argue the Earth can’t be old, but, unsurprisingly, they’re wrong about this. Anyway, we now use atomic clocks to keep standard time independent of our planet’s spin. They’re based on the frequency of an electron transition in cesium atoms—yes, seriously, and if you want details here they are. But this method is far more accurate, and can easily measure the time difference due to the slowpoke Earth. 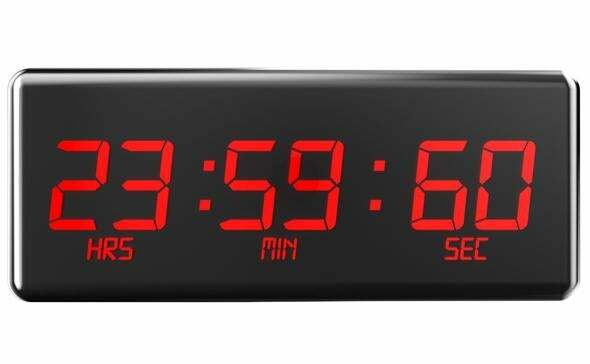 When the difference between the atomic clocks and the Earth clocks differ by more than 0.9 seconds, a leap second is added to civil time (the time used by civilian authorities*). It could technically be subtracted if the Earth’s rotation were to speed up, but that’s never been the case since this method was adopted. In fact we’ve been adjusting our clocks this way since 1972. In the 34 years since then, we’ve added 26 leap seconds to the calendar. The last one was in June 2015. But this year’s end will see another next leap second. What does this mean? On Saturday night, Dec. 31, 2016, at 23:59:59, one second will be added to our clocks. Instead of clicking over to Jan. 1, 2017, at 00:00:00, for one second the official time clock will instead read 23:59:60. I know, right? Weird. But if we didn’t do this, all our computer clocks and everything else would get seriously messed up. Timekeeping is a serious business. This probably won’t affect you in any way personally, unless you succumb to any existential dread of having this year be 0.000003169 percent longer. That’s been true of nearly every year for decades anyway. And think of it this way: The motions of heavenly bodies affect us in ways you may not realize. I don’t mean astrologically, of course; that’s just hogwash. Obviously: Even the Sun and Moon can only change the Earth’s rotation by a wee bit over centuries, so their affect on you is even, um, weeer. For me, this just reinforces my love of astronomy and science. After all, our human senses only perceive a tiny fraction of what’s going on around us, and our affairs are a minor thing compared with the Universe around us. I think that helps me keep a certain perspective; despite what happens on it, the Earth itself keeps on turning. Perhaps a scosh more slowly, but if that’s the price to pay to go along for the ride on this rotating ball of rock and water and metals careening through the cosmos, I think it’s an affordable one. *Not to be confused with the time to be civil, which is nearly all the time.